In the days since his death, there has been an understandable rush to protect Muhammad Ali and his legacy from disappearing into safe, easily digestible pabulum. Ali was a radical human being who at times was widely disliked by white America for his unapologetic blackness, his unwavering self-love, his ideas about race and his commitment to his faith. Thankfully, there has been a widespread rejection, especially via social media, of the idea that Ali “transcended” his race as he became one of the most recognizable people in the world. So how do we present Ali on his terms, without filtering the meaning in his existence through some larger context of white supremacy? Bill Siegel’s 2013 documentary, The Trials of Muhammad Ali, which presents an in-depth look at Ali’s journey to Nation of Islam and his refusal to fight in the Vietnam War, does an admirable job of accomplishing this. The film explains why someone would reject the tactics and politics of Martin Luther King Jr. and the civil rights movement at large, it does so in human, and perhaps unexpected, terms. “The whole civil rights motif was not attractive to us,” said Salim Muwakkil, editor of the Muhammad Speaks newspaper, at one point in the documentary. “We were city guys. We wanted to look cool and urbane. We didn’t want to look like farm workers.” As Dave Zirin, sports columnist at The Nation, consummate Ali expert and author of What’s My Name, Fool? put it, The Trials of Muhammad Ali is the documentary to see “for folks who really want to ‘get it’ deeply.” I spoke to Siegel recently about his film, now streaming on Hulu, and his relationship with Ali. This interview has been edited and condensed for clarity and length. I imagine the past couple days have been quite busy for you. I’m still overwhelmed with emotion and also just so — it’s overwhelming. He’s still The Greatest and I hope that people, in mourning him, celebrating him, remembering him, also take inspiration from him in a way that they incorporate into their own life. For me, he’s such a shining light of how it’s possible to lead a journey of self-discovery and become yourself in a truly moral, principled, lovely, deep, soulful, human way. It is difficult for you to talk about him? Not really. I was fortunate enough to meet him a few times and got to show him the film. It was a personal, professional thrill for me for the rest of my life — to watch him watch the film. I can honestly say that he dug it. But that’s easy to say ’cause I know that Muhammad loved nothing more than watching stuff about Muhammad Ali. Even though he couldn’t articulate verbally [at that time], he could track it entirely and he responded viscerally. When Malcolm X came on the screen, Ali bowed his head in sorrow. When Khalilah — his wife during the period the film covers — was on the screen, he lit up. He was just so animated throughout the film and just so fair with his own presence and, I’m sure, his own impact on humanity. He really is, to me, an example of being a man of the people, both in terms of what he gave, but also what he got. He loved people. Sometimes, it’s possible, perhaps easily, to not think of him as humble and as down-to-earth as my experience with him was. The first time I met him, I was in my 20s. I was working on somebody else’s obscenely well-funded documentary about Muhammad Ali. And when he would come to the office in [New York City] — it was this beautiful loft in SoHo, these suites where editors would edit. Ali would show up and the Brits would try and sequester him back in the corner office and Ali would literally rope-a-dope his way out of their office into the research pit where we were, and do magic tricks and just hang out with us. It was so clear that’s where he wanted to be. He enjoyed being with as many people as possible all the time. He would do magic tricks? Yeah, he was a magician. He was good with his hands. Very deft in that way. And because he was also a Muslim, one of the tenets of Islam is to not deceive. And so every time he would do a magic trick, he would explain it, so that it really wouldn’t be a trick at all and he got kicked out of the magicians union because of that! Because he would explain his tricks. I always loved that. He was good enough for Islam, but not good enough for the magicians union. 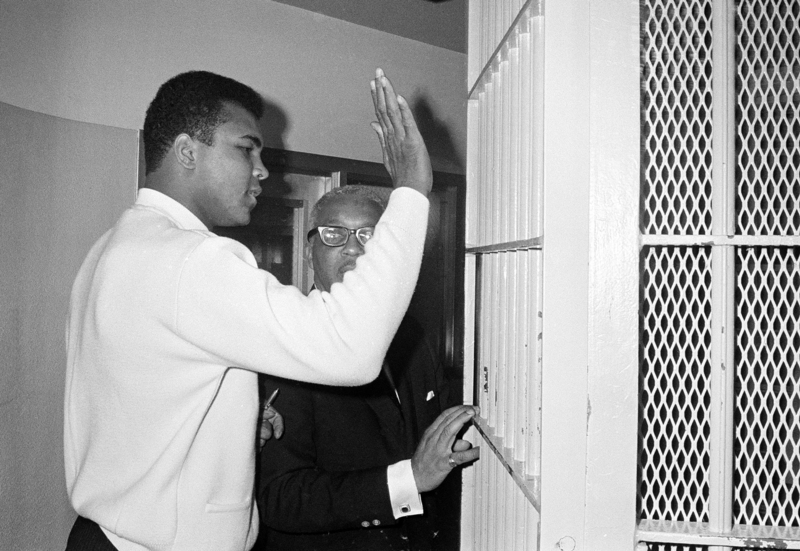 Former heavyweight boxing champ Muhammad Ali pats the bars on the door of the Dade County jail, Dec. 16, 1968, as he starts serving a 10-day sentence on an old traffic charge. Ali said this would be good training if he has to serve his five-year term for draft dodging. The former champion surrendered voluntarily today and is accompanied by his attorney Henry Arrington. When did you screen the film with Ali? They lived as worldly and as quiet a life simultaneously as I can possibly imagine. Muhammad Ali — he belonged to the world. But [Lonnie] made sure there wasn’t a lot of interference, disruption and chaos, and at the same time, honored, as well as she could, the fact the he did belong to the world. She understood that it was important to the world to have a chance to engage with Muhammad Ali. That’s what he liked to do. He liked to be out there. You say, ‘He belonged to the world.’ There are quite a few people raising objections to the assertion that he transcended race — they see it as an erasure of his identity. Do you think there’s harm done when people say he’s transcended race or anything else? It’s a measure, ultimately, of how much he does mean to so many people in so many different ways. I don’t think it excludes the fact that he certainly represented himself as a proud, defiant black man, refusing to go to Vietnam, taking the stand that he did. That was still relatively unusual at the time. We forget, when he refused to go to Vietnam, the anti-Vietnam War protest movement hadn’t exploded across the country. It was pretty early. The movement kind of adopted him in a way that counterculture did, in a way that some of white America came to, in a way that I do think was already happening. He’d already toured much of the Arab world before that happened. And the idea that there was a Muslim boxer named Muhammad Ali, that’s something entirely different there. So I think that people have a right to embrace on their own terms. Does that mean he transcended any of it? That’s for people to decide for themselves. The world clearly loved him. The idea that he was the most recognizable face on earth? I’m always struck by that phrase. Who would that be now? It probably changes every 15 minutes. Fame is so fleeting now. It’s such a blizzard. I’m not saying he didn’t love his fame — he did. But that’s not really what he was there for. He was fearless about representing himself and incredibly courageous in this really principled, moral way. It’s up to the rest of us to decide to take a measure of our own selves by the way we evaluate him. I think he became a large enough figure in the world that whatever you have to say about him ultimately says more about you. Your film is a deep dive into a specific period in Ali’s life. Is there anything in your archival footage that ended up not being used that you’d like to share? He totally revels in the child-ness of it all, which I think he never lost within himself, which is hard for us to hold onto, right? We get cynical and old. Ali always held on to that childlike wonder of the world and maintained that twinkle in his eye to the end. You could always see that, even when he was shaking with Parkinson’s. If you looked in his eyes, you could see the magic and that verve and youthfulness that will be treasured forever.